NAMDET are pleased to announce that with the fantastic ongoing financial support of our colleagues at BD Ltd. we are able to continue to provide the MDET journal throughout 2019. 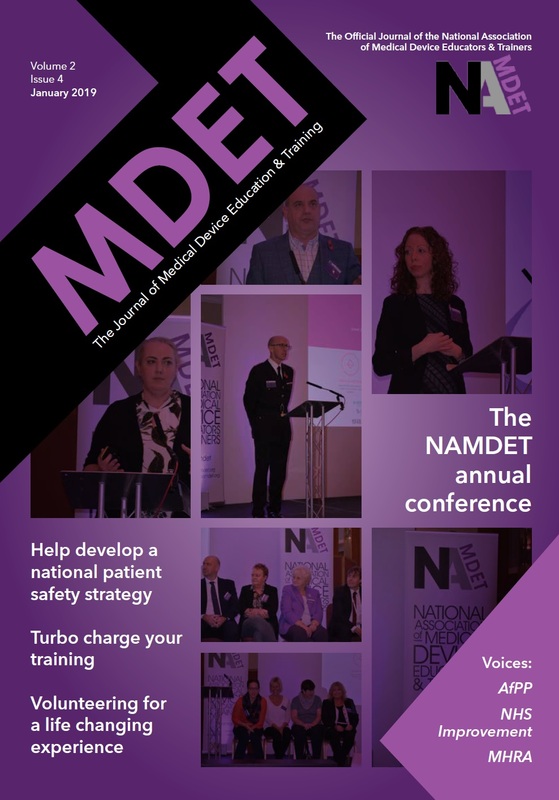 The journal remains free to all NAMDET members, those working in medical device training, safety, education, risk and governance and can be obtained via the MDET link above and via of the front page of the NAMDET website. Our hard-copy printed version goes out to 2,000 people and also has unlimited electronic versions for sharing too. Two NAMDET Board members (Robert Matthews and Marie Law) are also helping to liaise with all content, stories and subject matter. If you’ve never written an article before then don’t worry as we can help support you right through from first draft to final write up. If you have an interesting story that you’d like to share (or one you think deserves more detail) then we can link you with our medical writer and they’ll help to write up the article for the journal too. All NAMDET Regional chairs and secretaries are encouraged to share their meeting reports, and share any burning issues they have with all members. Colleagues at MHRA, NHSI, CQC, HEE and all arms lengths bodies are also encouraged to submit articles, news and updates as our readers are all engaged in device safety, education, regulation, governance and training. If you are working on any interesting articles, education projects, or new and emerging themes then please also use our contact form by clicking here and we’ll make sure that Robert and Marie get to hear about it.